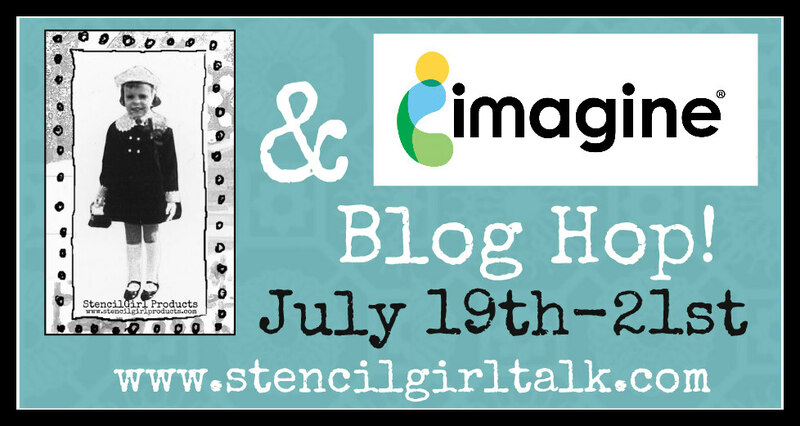 It’s Blog-Hop time! 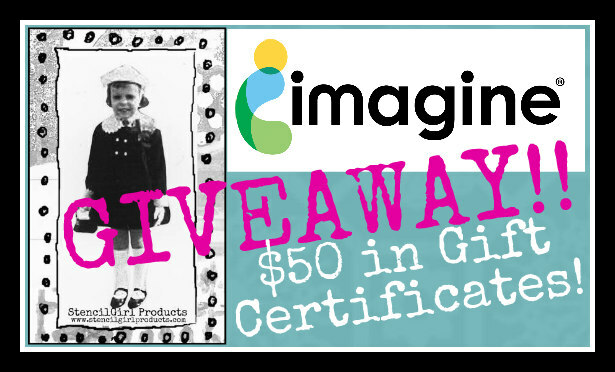 This month Imagine teamed up with Stencil Girl for a product/design team collab as well as a giveaway (more details below–make sure you scroll all the way to the bottom!). I had a lot of fun working with my new tools from Stencil Girl and used them to put together a mixed-media canvas. It started with an acrylic paint base and then–why I don’t I show you, instead. As you can probably guess, I took my biggest inspiration from the peacock feather stencil and chose colors that worked with that idea. I was more amused than I necessarily should be that I turned the dancing figure into a fan dancer, but it worked (I think?). Once I had all the basic layers in place, I ended up leaving it on my work table for almost a week, trying to decide how to finish it. The overall look was really bright, which is not my usual goal, and I wanted to add a stamped phrase but I wasn’t sure of the best way to do that at first. I ended up adding a couple layers of ink buffed over the creative medium bits to highlight the textures and then stamped the message onto vellum, applied it with the Shimmer Artist’s Medium, and called it done! Love the use of peacock feathers instead of a fan! So cute! Thank you, Marie! I agree, they worked so well! So pretty! I like the ballerina and the subtle color. The motion you created with this vibrant piece is wonderful! I can hear the beat of the music that she is dancing to as I look at it! Great idea, and I love the way you used your imagination! It’s always fun to find new things to work with, right?! She is beautiful! Thanks so much for sharing your deign. Thank you, the pleasure was mine in the creating, only surpassed by being able to share it with all of you! Beautiful page. Thanks for sharing. That is Way Cool. Thanks! I love how you layered. Beautiful!